I have been following this thread since the beginning, I like seeing information about cable HDTV here in Rochester Minnesota but some of this information has me concerned. The HDNet issue is not as important to me as the multicast issue for KXLT. Its bad enough the KTTC does it, I was hoping since KXLT doesn't have subchannels that when the conversion to HDTV is done we would get the whole spectrum. I will be more than pissed off if the NFL games are in standard definition. I also know that the others replying don't watch KTTC very much at all but that is the reason why I got cable in the first place. I had unreliable reception OTA for KTTC, sometimes it would be rock solid other times it would break up greatly. I had attributed this to signal strength but now know that was only part of issue. Lately it seems to be breaking up on cable not just OTA. Last night I tried watching Crossing Jordan and there were stretches where it was unwatchable. I have had little luck calling in problems with this to the cable company, they say its KTTC and given that both the cable reception and OTA have similar problems they are probably right. The problem is I don't know who/where to complain so someone at KTTC can fix the problem. I was willing to live with these issue before I was paying for the reception, but now I am thinking if this doesn't clear up I might just give up and drop back to regular cable and save a lot of money. That might be hard to do because I do like seeing sports in HDTV, since they added ESPN there are more options which will only grow over time but since the cable company and the local affiliates don't seem to think HDTV makes them any money the only thing I can do is drop service back to the minimum I require (which is expanded basic cable). Maybe that would send a message that HDTV provides income they would otherwise get. Anyway, keep the updates coming and if anyone has any ideas on how to solve these problems I am open to suggestions. The problem is I don't know who/where to complain so someone at KTTC can fix the problem. I was willing to live with these issue before I was paying for the reception, but now I am thinking if this doesn't clear up I might just give up and drop back to regular cable and save a lot of money. I reccomend a respectful, honest approach as opposed to a confrontational one. Thanks for the link, I've been meaning to e-mail KTTC for a loooong time regarding their useless multicasting, their annoying multi-color bug (in addition to the opaque NBC one) and their idiotic stretching of 4:3 material. But since I watch NBC so little I haven't bothered. It doesn't help that I wrote them once before although I got a response from the general manager, he forwarded my concerns to engineering and I never heard from them again. Now might be a good time to try again. I finally got around to recording Leno via cable and OTA and of course tonight it wasn't in HD! So I'll have to save that experiment for another time. On the cable front, I got my bill recently and since it shot up $20 just to get 6 HD channels: KXLT, which has no HD at all (and stretches 4x3 to 16x9), HDNet, HDNet Movies and ESPN-HD, all of which are getting squashed bandwidth, KTTC which was getting lots of breakups during Las Vegas, and SHO-HD, I had to basically send an ultimatum. I essentially told them that I'm happy to help them debug their problems as long as they're interested in fixing them (or if they even consider them problems ), but I don't really care to pay for the priveledge of doing so. Nor do I care to pay for HD service that is anything less than the signals the content providers are sending to Charter, sent to me unaltered. I also asked them to clarify their position on their HD service, if they are committed to providing the highest quality service, or simply a "higher" quality service that they can charge a premium for. I understand that this type of ultimatum is largely useless since I have no leverage and they couldn't possibly care less if they lose out on $20 a month from one customer who nitpicks the picture quality. My only hope is that my contact genuinely wants to help and has the freedom within the business to do so. Two weeks ago I was optimistic... now I'm expecting to be returning my cable box before the month is up. I watched Andy Richter on HDNET tonight and for a while I thought maybe they fixed the bandwidth issue since the show looked exceptionally crisp, but then when it went to commercial I could see the pixelation that is causing the picture quality issue. Seems like this issue is not as obvious with some material as with others (most notibly live events whether sports or anything with significant camera movement). I think I tried emailing the engineer last year when KTTC-DT was off the air for a while and never got a response, I wonder if trying to call the phone number would be worth a try, or maybe that would be too pushy (I don't think they had the phone numbers list back then). If the EMAIL is just an address provided the the station it is possible the engineer might never look at it or rarely does. Anyway if Las Vegas was breaking up tonight that makes two nights in a row with problems. Unfortunately I won't be able to watch anything this week on KTTC because I am working late all week, but I will watch Saturday and Sunday to see if things are working better. Does Charter use Moto 62XX's or SA 3250HD's in your cable system? I live in a Charter system in L.A. who is adding the SA 3250HD STB with FireWire later this week. However, if your PQ issues are duplicated nationaly across the Charter foot print then I might as well stay with D* and use my 169Time STB to make DVHS tapes of premium HBO/SHO/HDNetMovies content. I get excellent OTA HD already and have a network of PCI HDTV DVR cards in PC's that work very wvery well and have unlimited HDD capacity. I've gotten quick responses (less than a day) when I've sent him emails. At least once, I've helped them discover a problem with their transmitter, so maybe they're nicer to me. He did finally admit that although he took FSN-HD out of the multiplexer, he never "turned the knobs" back up on HDNet and HDNet movies. So they were still being restricted to 13Mbps, which was what I was trying to tell him all along. He said he'd fix it later today or tomorrow. He said 5C will be turned on in the next 1-2 weeks. Although we've all known it's been coming and 5C doesn't itself prevent consumers from recording content, this will pretty much kill cable HD for me, even without the PQ problems. I'm not buying a buggy tape deck to record HD after going for so long being able to schedule recordings on my PC from work or anywhere else and be able to view the recordings on any computer in my house. The worst one however, was that in spite of my and his complaints, it's still the policy of Charter to use one 38.8Mbps QAM256 channel to provide up to 3 HD channels. As anyone can see that's unacceptable as a general purpose policy. In same cases with lower bandwidth HD channels (like SHO-HD) that could work, but at only 13Mbps I would call SHO-HD second rate to begin with. There's nothing stopping them from cramming HDNet, HDNet Movies and ESPN all on one QAM which would basically render all of them unwatchable. I told them that their goal should be to provide their customers with the highest PQ possible, which means not altering the bitrate of the content. If they get a 19Mbps channel, I want all 19Mbps. That's what I pay for after all. That still leaves them room to juggle channels since not all of them at that high bitrate. Probably the most damning thing though was to point out even though quality is subjective and there's no minimum standard for quality or bitrate to still be called "HDTV", free OTA HDTV is obviously and significantly higher quality at higher bitrates than what Charter expects us to pay for. I said that was a pretty good indicator of which side of the quality argument they're on, and that people aren't going to be beating down their door to get what they're selling. I don't think this will go anywhere though. They know what they're doing marketing wise and don't make money being stupid. People will pay for mediocrity and people for the most part won't go back to using an antenna to get stuff for free. Their loss I guess. I for one won't pay for this crap and hope others won't either so there might be a chance for change. Keep in mind that the 3 channels/QAM thing is corporate-wide, not just Rochester. So if any Charter customers not in MN is reading this and you think your HD doesn't look very good, it's probably not your eyes. And it's easy to verify if you have the Moto boxes. Just check the channel status and see which carrier frequency the channel is on. If more than 2 have the same frequency, they're cheating you too. Picture quality has never been a concern for cable companies except maybe a the very beginning when they used better reception as a way to get people to subscribe. All you have to do is look at the problems with their analogue tier and its rolling line to know that picture quality doesn't matter. The HD channels may not be the best for HD but when you compare it to the analogue and regular digital channels its like night and day. I am willing to bet that the engineer doesn't want to restore HDNET and HDNET Movies to what it was before because then when they have to add channels people will be used to the way it is. If he changes it then the next group of subscribers will notice when it changes. On another note, I remember when KTTC used to have a higher quality picture when they first went HDTV and only Jay Leno was in HDTV. I think that show doesn't have the same wow factor it once had because either the station (KTTC), the network (NBC) or the show has cut down the resolution. FWIW, I have been pretty happy with the picture quality on HBOHD, hard to say with SHOWTIMEHD since they hardly have any HD programming that I watch. I also think ESPNHD has improved a little since we first got it but that probably is the case of ESPNHD and the venues where the events are shot from and not anything Charter has done. I know, hell I can even agree with them up to a point. But the whole purpose of HDTV is jaw dropping picture quality and they're going to ruin it. And it's not a case of them softening it to the point of DVD quality, they are in fact rendering it totally unwatchable in some cases due to the ridiculous macroblocking and compression artifacts. That's the attitude that I'm afraid Charter is banking on. Most people won't know any better so they'll just accept it. And after next week people like me won't be able to monitor the streams anymore so we won't have any hard evidence of what they're doing. But my eyes know better and what they're selling people isn't worth the price. I kind of got the feeling he was just stringing me along to try and get me to admit it looked good even though he hadn't done anything. But I can't be sure. He may have just forgot and he did finally own up to what he was doing. He said he agrees with me anyway and would rather keep the compression to a minimum but he's kind of stuck. For now though they should be able to do what I ask and give us the streams essentially unchanged. I first saw KTTC in HD in March of '02 during the winter olypics and they were only 15Mbps even back then. The Olympics macroblocked, and Leno macroblocked. At the time I was worried that that was an necessary evil with HDTV, probably much like newbies are now with all the macroblocking on cable HD. Now I know better. SHO-HD and HBO-HD should be the least effected since they're relatively low bandwidth to begin with. ESPN should be taking a big hit but there's so little HD on it's probably hard to tell. The HD I recorded weeks ago looked terrible. I don't know what they're showing in HD these days, baseball I presume. That probably looks halfway decent since nothing happens 99% of the time. 13Mbps is plenty for a static shot of a guy scratching himself. I'm in St. Cloud, MN and just subscribed to Charter HD. 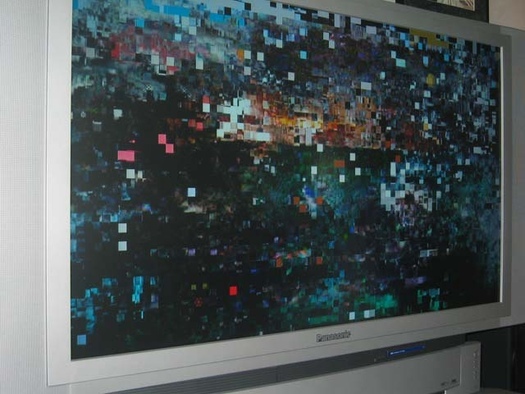 I'm having tons of problems with pixelation and audio drop out on pretty much all the hd channels. After reading the posts in this thread, I'm wondering if this is just the way Charter's HD channels look. What do you all think. I would go with OTA but I think I'm out of range for an indoor antenna (I live in an apt building so an outdoor antenna is out of the question). Do you all think my problem is a Charter problem or an equipment problem. I'm having tons of problems with pixelation and audio drop out on pretty much all the hd channels. After reading the posts in this thread, I'm wondering if this is just the way Charter's HD channels look. If you're having audio dropouts, the odds are good that your cable signal isn't clean enough. Call the local office and tell them you're having reception problems. The problems with low bandwidth only seem to impact video, perhaps because audio quality is harder to hear. will charter ever add local abc and cbs hd in minnesota? Do you also have that new Moxi box? First-timer posting here, thanks for bearing with me. I've had Charter HDTV since December, and in particular, KTTC is getting worse. Law and Order scene transitions (that ka-chunk sound) always pixelate badly, unlike before. ER is almost unwatchable. Jay Leno doesn't look as sharp (or am I no longer easily impressed?). Is this Charter? or does KTTC OTA have this problem as well? Also, I just got the regular Moxi box yesterday (not a beta tester); what forum should I put my first impressions in? The post by wrmmoxi sums it up nicely the experiences I've had. But mine goes one step furthur in that it just fails with HD half the time. I mean the channels lock up so bad I can't watch anything. I notice the chunky affect otherwise almost all the time. I'll let the other folks reply about the OTA stuff. I've noticed too that Leno is not so good. I don't think it's been broadcast in HD lately (dfriend can confirm that). I'm returning the moxi this week to get charter's stand alone hd tuner. I'm hoping i can at least watch the HD channels then. KTTC OTA has the same issues with breakups during Law and Order. Also the problems I mentioned in a previous post about Crossing Jordan Sunday night also happened OTA. This is an issue with KTTC, not the cable company but I think the cable company should be the one to force KTTC to fix it since they are the ones advertising KTTC in HDTV on cable. They are using it to sell HDTV service so they should make KTTC fix it. Its obvious nobody at KTTC knows the problems with their HDTV signal, it the same thing happened with the analog signal it would be fixed immediately. I have the Motorola DCT5100. What is the Moxi? Moxi is the new PVR with HDTV capabilities that Charter's rolling out, starting in Rochester. It has up to 80(?) hours recording of standard TV or 20 hours of HDTV. The menu displays are completely different than the standard cable box. I was told they will have the SA 8000HD in L.A. within 90 days. I think that the various systems they originaly bought have different head end equipment, and, they are deploying different STB's and DVR's for that reason as well as the desire to encourage competative pricing among manufacturers rather than having one system-wide standard. Looks like HDNet and HDNet Movies have been fixed, finally. I watched them briefly yesterday and they looked clearer and didn't seem to macroblock at all. This evening I finally recorded a couple of clips and sure enough the bitrates are much higher now, averaging 17-18Mbps. The bitrates still look different from previously recording HDNet streams however, in that they seem less variable and don't peak as high as they used to. But my guess is this is good as they're going to get and in the future will probably get knocked back down to 13Mbps when they add more channels. So while HDNet and HDNet movies are watchable again, ESPN is still sharing with HBO-HD and SHO-HD because the locals are still both taking up a full QAM each. I'll probably pester my contact one more time on that issue, but I think I'm going to cancel next week. It just isn't worth it. In the last 6 months I've recorded probably a dozen movies from OTA and in the 2 months I've had cable I've recorded precisely zero. Sure the OTA movies have commercials, but at least they're high quality and worth watching, plus since I can record I can skip the commercials. And it's FREE. Yes, I've notice the improvement too. I think it started sometime Friday. Glad to have HDNET and HDMovies back to the high PQ as before. Hopefully, they keep it this way, but I'm worried that they may sacrifice it to add channels. If I have to decide, I'd rather have fewer, high PQ channels than more channels with marginal PQ. What's the point of high-def anyway. Thanks for your help dfriend in getting the message to Charter. KTTCDT appears to be off the air both OTA and on cable. Happened at the end of West Wing tonight. I am hoping that whatever is broken is the reason for the break ups that have been happening for the last few weeks and that they will finally be forced to fix it. Yeah right, guess it doesn't really matter until the olympics start, that gives them a few months to get things put together. Thanks for the update, I was about ready to call KTTC to ask what happened. Using Charter's new Moxi box to record HDTV, I'm getting leary of recording KTTCD (782). Saturday Night Live went dark with about 25 minutes to go; I was taping HD, but switched recording to channel 12 (I was recording it for my wife to see the Olsen twins). Until they get it COMPLETELY fixed, I'll probably set recordings to the analog channel. indoor probably won't work but I know that a CM4228 works fine. I am in St Cloud also. I say the channels are looking very soft up here lately. From the info posted in this thread it appears to be company wide and no remedy in sight. Might have to try out Astound. do you know if astound is planning on adding locals to its hd package? I finally cancelled my HD package today. I don't think I've watched anything in weeks. A few HD channels with nothing worth watching for $20 a month is way too much. That's even before all this nonsense with the PQ. I did send one final e-mail to my contact at Charter thanking him for fixing HDNet. I also asked him about TNT-HD since the western conference finals are in HD. He said he's ask the marketing department but I haven't heard back. I wouldn't be surprised if the marketing department didn't even know TNT had an HD channel. Of course if they add it, everyone will see their PQ degrade. Sorry guys. i might be giving astound a call to how there stuff looks...... pm me if you have q's. It's the job of the salesman to give honest and accurate product info and let the customer decide if it fits their needs. Cool. Let me know how it looks. My only problem with them is that they currently don't offer any local hd. Charter at least has local fox, so I should be able to see as many Vikings games in hd as Fox broadcasts. Can't give that up.